As a result of the meaningful thinking you model and students practice as partners, students eventually learn to stop and think independently. When they reach that point, your students are ready for DEJs – double-entry journals. These journals will help your students prepare for dynamic book discussions by giving them a way to focus on their thinking and write about it. A word of caution: While a valuable tool for spurring and focusing discussion, DEJs require work to master. Use them sparingly and strategically. For example, my goal is to give students most of the time during the reading block to read and talk. As a result, I set aside a limited amount of time for students to create DEJs. Also, be cautious when using DEJs with students with learning disabilities. Asking them to write while reading can interfere with their comprehension. I recommend checking with students to see if a new strategy helps or hinders their progress. That said, DEJs really do spur and focus discussion. I love DEJs for this reason: Students bring what they don’t understand to reading circles. Teachers don’t write any comprehension questions. The discussion grows out of the observations made by the stakeholders. To prepare, students create DEJs by folding a piece of paper into two columns. The labels that students choose for each column focus their thinking. The first double entry I teach, even to 1st graders, is Notice-Wonder. On the left side, readers write what they noticed in the text. On the right side, they write what the observation made them wonder. Students sometimes find it easier to first write what they are wondering and then why they had that question. So, for some students you might try Wonder-Notice. As students read on, they’ll note what questions get answered. They’ll bring the questions that don’t get answered to discuss with their peers. It’s an easy way to structure Book Club discussions. 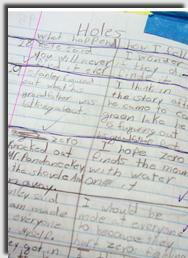 Here’s an example of how a DEJ helped a group of fifth graders answer a question they all had about the same text. One brought the Notice-Wonder above to her group. She had discovered a new meaning for the word “plant” and wanted to discuss it. Other students shared that the word had puzzled them, too. After 5 minutes of discussion, they agreed to look up the word. They discovered that the author chose to use “plant” to mean “put”: as in, the faculty “put“ the character there to improve school spirit. Until that discussion, the students had inferred that the school mascot must be a “plant,” like a tree or flower. The new definition completely changed their understanding of the text. Another strategy I introduce is notice-infer. Again, the student quotes, summarizes or retells the text briefly on the left side and infers what might happen on the right. As you can see from this entry, the student’s inference, written as a question, can encourage meaningful discussion. In this case the student’s observation gave the teacher a natural way to introduce the class to an important concept: foreshadowing. Other students now wanted to keep reading to see if the prediction (a subset of inferring) came true. As it turns out, that one sentence was critical to the path of the plot. Good noticing! Students sometimes investigate questions about how to improve their ability to read. In the example above, one group paid close attention to how they used fix-up strategies when they came across unfamiliar words. I asked them to watch their brains at work and make a list of the strategies they used to figure out one word. To make it easier, the readers referred to their fix-up bookmarks where the strategies are numbered. They recorded the number of each strategy they used, in the order they used them. This approach meant they didn’t have to write much. It also worked for me, since I was more interested that they follow their line of thinking for the discussion it would draw out. The third-grader who wrote the above DJE was surprised that she figured out the word by herself. She was even more amazed that she had used so many strategies. In this case, the student (1) sounded out the word, (4) looked at the picture, (5) skipped the word and read on, (6) reread, (7) read slower, (8) took the word apart looking for syllables, (2) reread the context clues, and finally (9) took a guess. She brought the word to Book Club, where she learned that she was correct. “I had no idea that I could stick with it and keep using clues until I figured out the word,” she said with pride. We all know that this student would not have used all of those strategies if I told her to. That’s why I try to craft investigations that students find interesting and useful. To create lessons where students investigate different lines of thinking, simply change the titles of the columns. When students investigate reading from alternative perspectives, students learn how to use each skill or strategy. Students’ comprehension improves dramatically when they know how to use each strategy.